When we sit down to chat with Cristin and Courtney over coffee, the energy is palpable. They’re here to talk about their roles as Program Leaders of the Mountain Adventurers Program – an active learning initiative that gets students outdoors and experiencing the mountain culture of the place they call home – and as they settle down to start talking, we can tell that this isn’t just a day job for these highly-engaged, hands-on mentors. 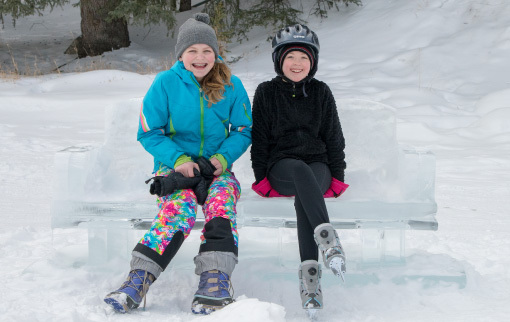 It’s immediately obvious that both Cristin and Courtney, or “Lynx” and “Splash”, as they’re affectionately known by the students, get a lot of personal fulfilment and joy out of leading a program that gets Banff’s young people out into nature. 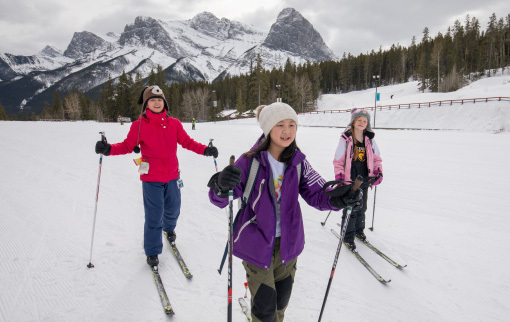 And what can be better for Banff’s Grades 4-7s than getting to try an epic roster of mountain activities, adventures and physical pursuits throughout the year? 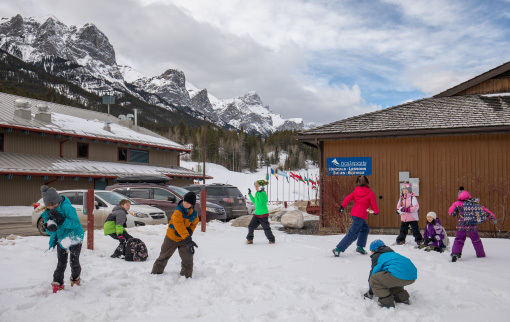 Born out of a passion to find a positive way for students to spend time when school is out of session, the Mountain Adventurers Program replaces the typical ‘hanging out’ of Banff’s youths; switching out hours of YouTube watching and video game playing for a supervised outdoor experience that stretches imaginations, develops an appreciation for the Park through fun activities, and supports children to experience new pursuits. The program is a partnership between the Town of Banff who deliver the programming, and the Wim & Nancy Pauw Foundation providing the funding. 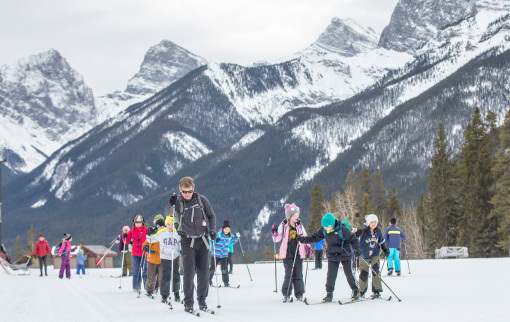 Here, we find out just what the Mountain Adventurers program is, what’s involved, and why Banff’s young residents are getting much more out of it than just playing outside on a Friday afternoon. Q: Firstly, for those who don’t know, can you explain what the Mountain Adventurers program is? A: [Courtney] Of course, it’s an extra-curricular program that was developed to provide a positive use of time for Grades 4-7s during Friday afternoons off, where students would usually be out of school and on free-time. As the school division allots every second Friday afternoon for professional development fulfillment, we jumped in to use that block throughout the school year to get the kids out into the Park and enjoying different and new activities. 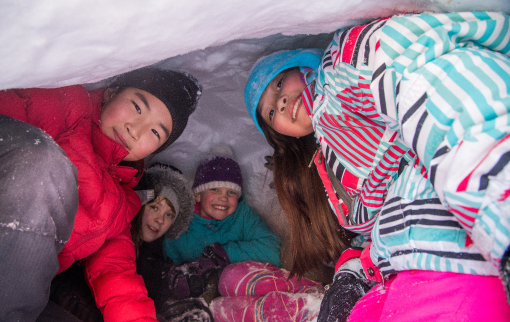 For many working families in Banff, this is a fantastic solution for their kids to be with friends, in a supervised, outside environment; trying outdoor activities and build not only their excitement, but their skill level, for different mountain pursuits. Q: And the program runs across Grades 4-7s? A: [Lynx] Yes, that’s right. It started with us building a program for Grades 4, 5, and 6, but this year we were able to extend it to Grade 7s also. We’re excited about the next school year too, as we’ll be opening Mountain Adventurers up to Grade 8s for the first time. Q: Tell us, what adventures and activities are included on the 2018 Mountain Adventurers line-up? A: [Courtney] We have lots! 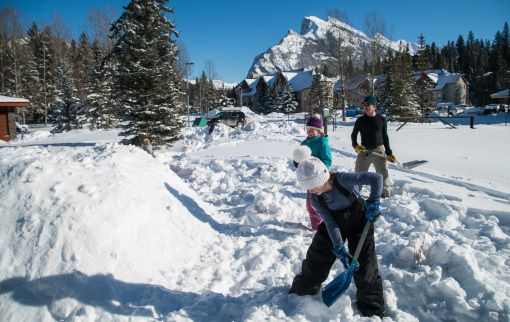 This winter we’ve been busy doing everything from quinzee building, cross-country skiing at the Nordic Centre in Canmore, and ice-skating at the Fairmont Banff Springs rink. Now we’re getting into the warmer months, we’re starting to roll into our summer program, which means hiking, kayaking on the Bow River, mountain biking, and even golf at the driving range. We also have indoor climbing at Elevation Place for our Grades 4s and 5s. Q: And you work with many Banff businesses and local partners to offer these many activities of the program; how do these relationships generally come about? A: [Courtney] It’s so great, we’re able to take advantage of not only the mountains and natural, wide-open spaces we have around us, but also the tourism partners and adventure operators we have here in Banff. We’ve worked with the team at Mt. Norquay often, and this season we visited Sunshine Village for the first time and snowshoed the meadows. 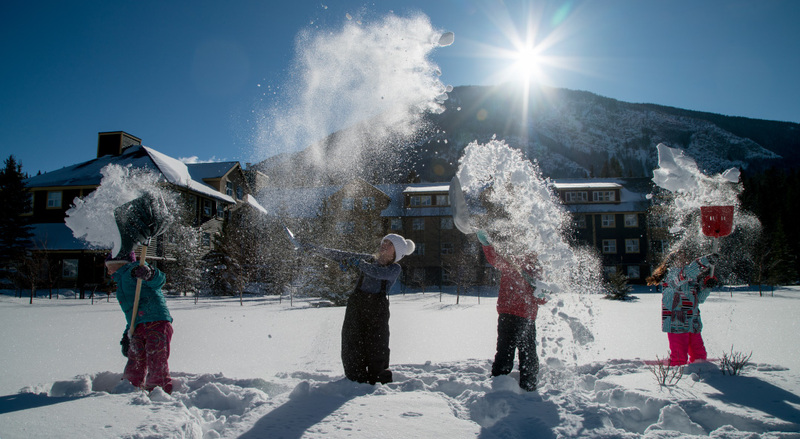 We partner with the Fairmont Banff Springs in both the winter and the summer too. These relationships start, really from personal connections or introductions – if there’s an activity that we can build into the program and we have a great colleague to work with to create it, we can make it happen. The beauty of the Mountain Adventurers program is that we can adapt it as we go; we’re keen to keep improving the program, and the diversity of activities only enhances the experience our students get from it year after year. Having the flexibility to add new experiences into the program, or work with a partner to offer a different activity, is always exciting for us. Q: As Program Leaders, how do you prepare for the Mountain Adventurers program? A: [Lynx] There’s a lot of organization and prep that goes into each Mountain Adventurers session. For example, I always want to make sure that I know the trail conditions well before we get there, so I’ll hike it on my own to see if it’s doable for our student groups. I will go out and put myself into the mind of our kids; try to figure out if this trail will be challenging enough, or interesting to them. Weather here in Banff can often challenge us too! As Program Leaders, we often need to think on our feet and adapt the sessions around Mother Nature. I remember last year we experienced a very long cold snap, so we modified pretty much all of our winter sessions. 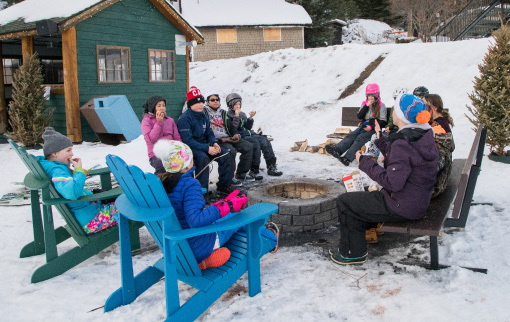 We made sure we had flasks of hot chocolate to hand and built a fire, so the kids could quickly warm up in the breaks. We always work around it – and everything is great learning for the next time! Covering all the safety bases is also imperative of course; running through all the checks to ensure our kids will be in a positive environment and succeed in that activity. Q: And what’s been the general response to the Mountain Adventurers program from the students? A: [Lynx] Oh, they’re always excited, always enthusiastic. They have fun that’s for sure. 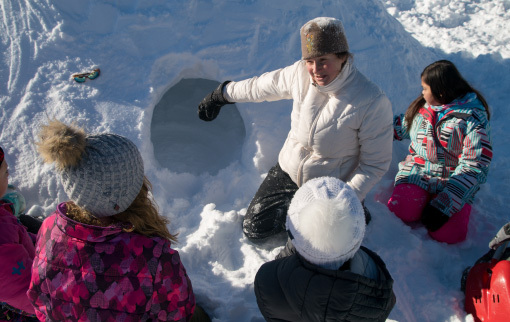 Sometimes it can be a struggle for them, and they can get tired from being outside and active – we’re out there in the outdoors for three or four hours – but it’s all part of the learning, not to mention great character building for the students. Even when our students try an activity for the first time, or perhaps they don’t start out having the skillset for that activity, but they work on that over time. Or, maybe they’re dealing with anxiety or nervousness around trying something new. We see them transform during the sessions and develop their confidence in such a short space of time. And what a sense of accomplishment that comes from overcoming that; doing something new with their friends – often in the cold – and then by the end of the afternoon, we see that even those that have been challenged are just beaming from ear to ear! It’s so awesome to be part of that. Q: From your experience as Program Leaders, have you any advice for parents wanting to try activities with their kids for the first time, to alleviate any nervousness or anticipation? A: [Lynx] Yes, for sure. 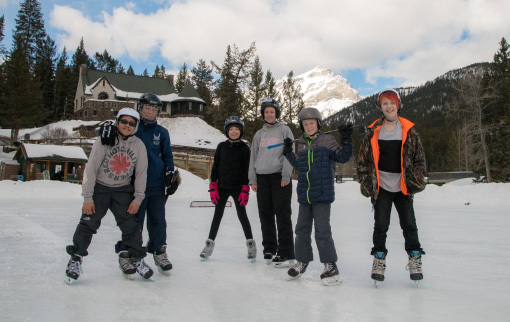 With the Mountain Adventurers program, we’re always trying to challenge various skill abilities and a wide range of confidence levels in our groups – we’re accommodating Grades 4-7, so the activities need to fit around those differences. We never want to overwhelm the beginners, but we also want to keep the more advanced members of the group engaged and excited, so we’re juggling that within our sessions every term. One way we have found to balance this experience gap, is to involve the students directly by asking them to decide the level they are comfortable with. For example, when we go mountain biking, there’s usually such a wide range of ability on the bike. So, we have three groups, where each of our leaders will say, ‘you choose: how fast do you want to go? Would you like to be in the fast group, middle group, or do you want to be in the beginner group, where we’re just having fun’? This means everyone is feeling relaxed and having a good time. We’ve found it works so well and the kids are ready to get into it and enjoy themselves. Q: Can you think of a time that the students have overcome obstacles during the Mountain Adventurer activities? A: [Lynx] Absolutely, all the time. I’ll always remember this one student: she struggled to get her ice skates on at the rink and was very nervous as it was her first-time skating. Well, we could not get her off the ice that day, she loved it! We do also see that the kids will encourage each other too. For example, with rock-climbing, we’ll see the expert climbers giving their classmates little tips and cheering them on, or reassuring them that it’s okay and they can do it. That’s really neat to see. Q: Why do you think programs like this provide such a positive learning experience; and what is it that you personally like about being involved? A: [Courtney] For me, it’s seeing our students try something that they have never done before or might not get the opportunity to experience outside of the Mountain Adventurers program. It’s so affordable for parents [the sessions are just $5 to register a child], meaning the program can be open to all. Taking a student into an experience that is challenging and exciting to them; see them succeed and noticeably develop during that time, now that’s rewarding. A: [Lynx]: You know, I’ve been reading a lot, as I’m a mother, about how we are bringing up our children in the 21st century, and the way the world is. Everything is changing fast; technology now shapes everything in our life, the way people are getting jobs has changed, what our children need to succeed and get the skills they need is so different. Everyone knows that being active, healthy, spending time outside and having many experiences, is just so good on so many levels. For me, that would be my number one reason for doing this. I think it is so important, and it’s fulfilling to be part of this movement of making sure kids are outdoors and are developing physically, emotionally and mentally. Q: Finally, (because we have to ask), where do the names “Lynx” and “Splash” come from? A: [Lynx] Ha! Well, it was the Town of Banff that suggested that for our kids’ programming, we give ourselves “camp names” that we would be known as. It was a way of having some fun, and I chose Lynx, as it is a symbol of the wilderness – as I studied wilderness survival. Lynxes thrive in the mountains and have beautifully adapted to life in the winter. I really resonated with it, and now it’s become my identity in the community. Parents, colleagues, students, they’ll all shout ‘Lynx!’ across the street to me. A: [Courtney AKA Splash] It was actually one of the 2nd Graders that named me Splash, but I liked it instantly. From that point, I’ve been Splash! *The Wim & Nancy Pauw Foundation support the Mountain Adventurers program with an annual donation, to offset the cost of the activities and keeping the program affordable for parents.